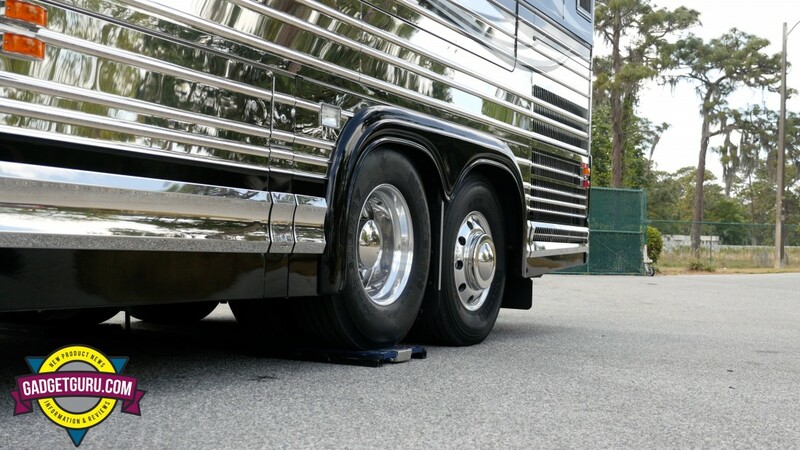 How Much Air Pressure For The Tires On Your Specific RV? 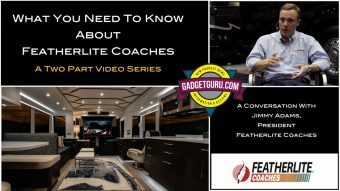 Whether you own a Prevost or any brand of motorhome, a travel trailer, a 5th wheel, a camper or basically any style of RV, you’ll want to watch the video that appears at the bottom of this post. 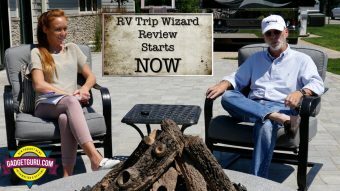 That’s because today’s editorial and video addresses a question that’s often a topic of conversation among RV owners: How do I determine the specific amount of air pressure to place inside each tire that’s correct for my coach or vehicle? Whether it’s a car or a motorhome, having the tires filled to the correct pressure level is an important safety factor and the video below will go through the characteristics that are typical of having too much or too little air pressure. With affordable tire pressure monitor systems (TMPS) becoming more common, monitoring tire pressure and in some cases, tire temperature, even while driving, has become easier than ever. 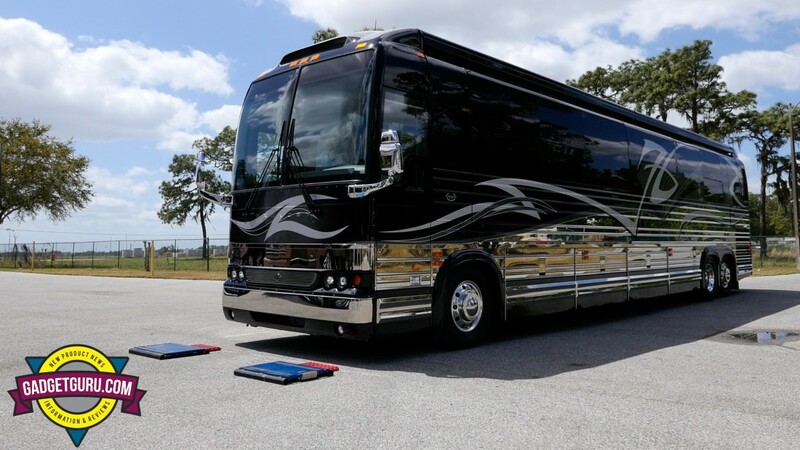 But the success of these devices is based on the user starting with the correct air pressure for their specific RV and entering those numbers into the TPMS device. Let’s face it, determining an accurate tire pressure for a specific automobile is pretty much a no-brainer. Just open the driver’s door, look at the inside of the post and you’ll find a manufacturer’s tire air pressure sticker that displays the recommended tire pressure setting for both the front and rear tires. As long as the car is using the same brand and size of tire that was originally equipped, just use those numbers as a guideline and you’re good to go. However, with motorhomes and trailers, things quickly get complicated. Due to a laundry list of variables involved, there’s simply no way for the manufacturers to accurately predict how the owner will be using the vehicle. For example, will you be traveling with a full or empty tank of water? How about gray and black tanks and the fuel level? 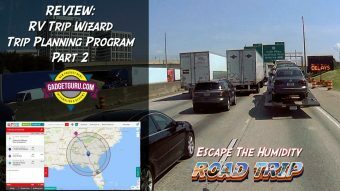 And of course, there’s the number of passengers as well as the gear and supplies that will be carried inside the RV and within the storage compartments. All of these factors add weight to the vehicle and there’s simply too many variables to have a one-size-fits-all definitive answer of how much air pressure to place in each tire of a specific make and model of a recreational vehicle. 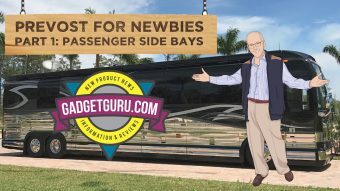 Based on forum threads that can be found on a variety of motorhome related websites, it seems it’s not uncommon for a RV to be delivered to a buyer with what seems like no rhyme or reason on how much air pressure in each tire. Is Better Information And Communication The Key? 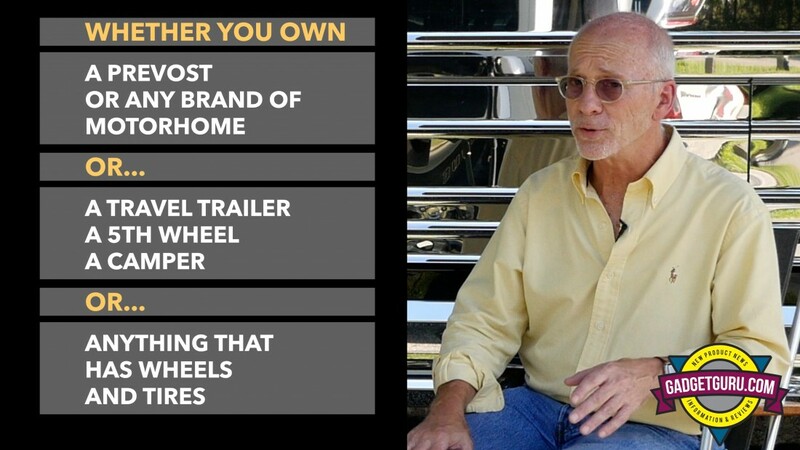 I’ve yet to meet a RV manufacturer who provides this level of information to the consumer. 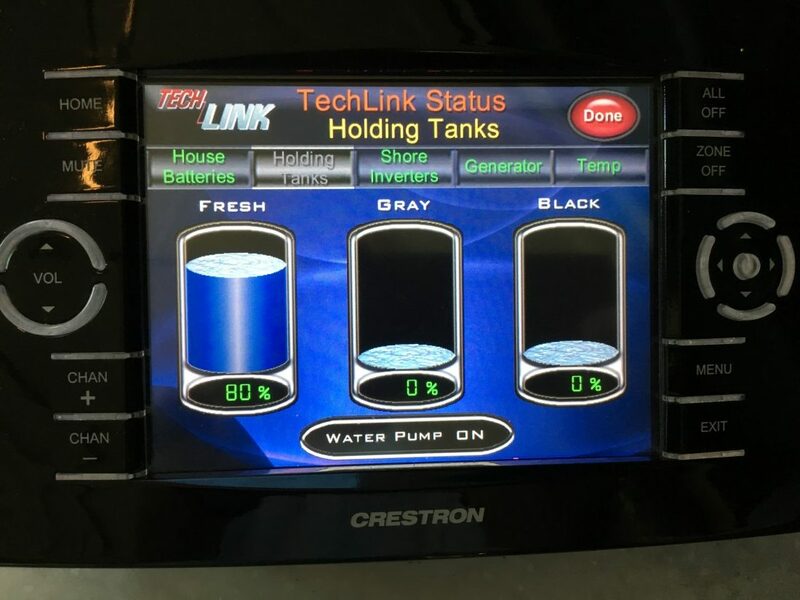 While it seems that having the manufacturer provide a chart that lists average usage estimates, based on the number of passengers, full tanks of fuel, water and cargo would be a common sense solution, I’ve yet to meet a RV manufacturer that provides this level of information to the consumer. And, to take this one step further, wouldn’t it be nice if the motorhome manufacturers had an interactive chart on their websites that would allow the user to enter a few parameters for a specific model that, at the least, displayed an estimated weight that could be translated into the proper pressures for each tire? In this day and age of algorithms, this seems like a fairly easy task. While there’s always two, if not three sides to a story, the posts I read came from a few buyers of this new model, who after taking delivery, filled the fuel and water tanks and drove the motorhome to a local weigh station only to find they were carrying too much weight for the rating of the chassis. The affected individuals returned to the manufacturer and addressed this situation with the staff. The initial answer provided was to travel with less than full water tanks, keep the fuel at less than a half a tank and limit the amount of gear in the bays. As a prospective purchaser, upon reading the various posts, I’ll admit that while one of this manufacturer’s models was on my short list, it quickly moved down a few notches. Fast forwarding a few months, I’m to understand the manufacturer came up with a modification that would allow the users to travel with the appropriate amount of contents for the average motorhome user. So the question in my mind is, how did this happen? 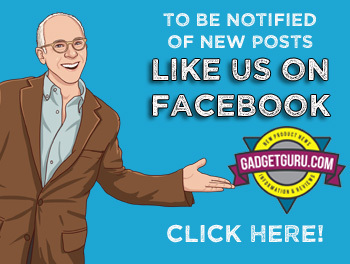 I did address this with the manufacturer in person at a recent show and the response I received was that they felt satisfied a modification was provided at no cost to the user. It seems the solution is for the manufacturer or the dealer that is delivering the vehicle to the buyer should be required to provide onsite individual wheel or corner weighing services so that after the new buyer loads the RV with fuel, water and gear, the vehicle can be weighed and, like the car manufacturers, provide a sticker and/or a printout that displays the recommended pressure for each tire. As I’ve learned and as you’ll see in the video, obtaining individual wheel/axle weights is relatively inexpensive and only takes a few minutes. What’s the difference between the information provided by drive-on scales and individual or corner weight services? Should the tanks be full and the compartments packed when weighing a coach? What happens when tires are under- or over-inflated? Should you rely on the air pressure that’s determined by the dealer upon delivery? What’s the price for this service? Allow me to add one important point that’s not mentioned in the video, My Friend and forum moderator extraordinaire, Michelle Cook advised that tire pressures should always be set when the tires are cold. Of course the pressures will increase while the tires roll down the road. Thanks Michelle!